Providing technical and economically feasible solutions to today's environmental issues since 1989. Ms. Schlachta is responsible for project management, and assisting in the management and technical supervision of environmental staff. The clientele Ms. Schlachta works with include the private and public sectors. Since 1998, Ms. Schlachta has managed projects, conducted fieldwork, and produced reports and applications for environmental land use planning, permitting and development. Ms. Schlachta has been qualified as an expert in wetland and wildlife ecology and environmental land use in Lee County, Collier County and the City of Bonita Springs. Ms. Schlachta has received her certification as an Authorized Gopher Tortoise Agent. 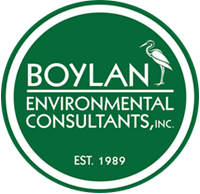 As an Environmental Scientist with Boylan Environmental Consultants, Inc., Mr. Mason is responsible for coordination of environmental permitting, conducting wildlife surveys, wetland delineations, and other environmental reports. Mr. Mason has coordinated with clientele from both the private and public sectors. The staff of BEC has the experience necessary to provide the various ecological services required by today’s regulations. BEC staff has collectively over 50 years of experience in providing ecological services in Florida. The staff has the necessary scholastic backgrounds for this field. Additionally, the staff of BEC participates in a range of continuing educational programs so that staff is current on the continuing changes in the scientific methodologies employed in the field and the regulatory rule changes. The company has a broad range of technical equipment to support its environmental programs. BEC’s extensive computer capabilities include AutoCAD, ArcMap, a large database of GIS information, historical and current aerial photography, a large array of graphic programs along with complete Windows support software. BEC is able to provide complete graphic support, GIS mapping, AutoCAD mapping, and desktop publishing documents in-house. The staff of BEC has the training to maximize the benefits of the system, and the system’s flexibility and speed allow the firm to provide a large variety of concise graphic materials in an economical and timely fashion. © 2012-2019 Boylan Environmental Consultants, Inc.